Furen Dai’s “The Language-Producing Factory” is about a language used solely by women. CHELSEA — Nobody knows how Nüshu, a language used solely by women, came to be. Academics have speculated that the language, used in China’s Hunan province, sprang from a patriarchal society that limited women’s education. Today, only a handful of women know Nüshu. 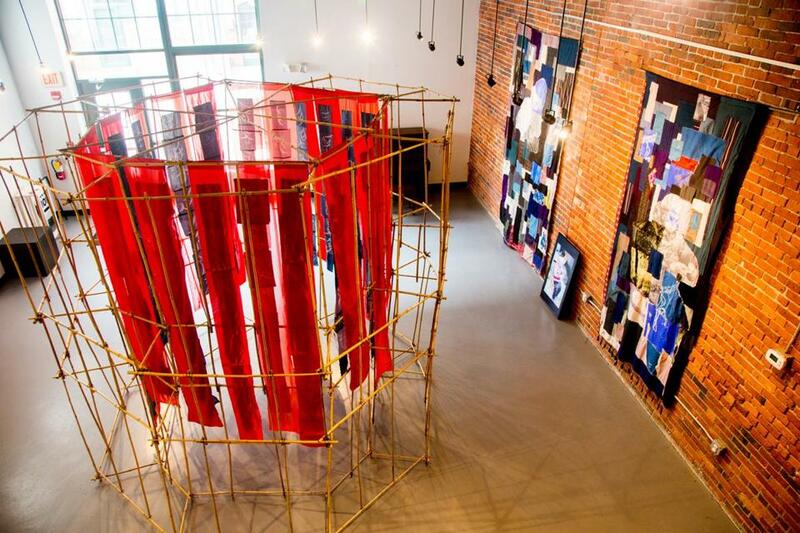 That knowledge may be more burden than treasure, suggests Furen Dai in her installation “The Language-Producing Factory,” at Gallery@Spencer Lofts. Language fascinates Dai. She studied Russian in college and worked as a translator in her native China. She earned her master of fine arts degree from the School of the Museum of Fine Arts at Tufts University last year. In 2015 and 2016, she traveled to Jiang Yong, the village where women once commonly spoke Nüshu. There she found an unfortunate echo of the power dynamics that likely spurred the creation of the language in the first place. “Women who know the language have been pressured by authorities to stay in the village and perform their cultural activities as entertainment for tourists for menial wages,” Dai writes in her artist’s statement. A giant bamboo enclosure sits at the center of her installation, streaming with banners written over in Nüshu. The language has become a cage. Videos of women singing, writing, and weaving at the local museum show just who has been trapped. A bittersweet and funny video depicts women churning out texts. In one segment, three women labor over embroidery hoops in a small dungeon. A manager upstairs cracks the whip by pulling a cord that yanks up workers’ braids. In time, the textiles grow into satiny shrouds that swallow their makers. Off to market they go, with women bound up inside. Dai’s lampoon succinctly literalizes the situation: A dying language is treated as a cheap commodity rather than a cultural artifact. Its speakers are caught up in the cogs of that economy. The underlying question is clear: Would this have happened if Nüshu had been a language of those in power? Cate McQuaid can be reached at catemcquaid@gmail.com. Follow her on Twitter @cmcq.